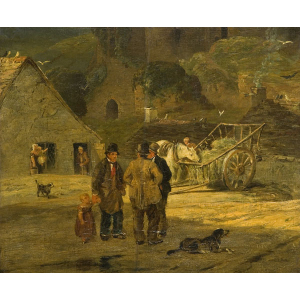 Summary: Oil painting showing a rural village scene. Three suited men in top hats, one with a child, are standing gossipping. Description: William Collins was able to work in two very different ways. This painting is typical of his more sober paintings of the old school style. The view is of a busy village, with three suited men in top hats, gathering centrally to discuss what's been going on in their area. 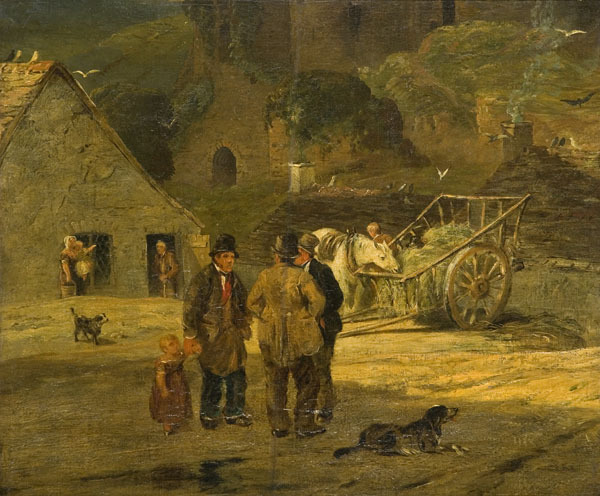 The hive of chatter and activity is reflected in the background, with smoke bellowing out of chimneys whilst men, women, children and animals are all out and about and looking around them. This is an innovative and unusual representation, as it was older women who were traditionally viewed as gossips.